*staggers in holding a HUGE bouquet of red roses and holly* Here they are, Gromit! We found it!!! And folks are already here! Thought we'd be early, but guess not. OUCH...holly is prickly. These are for my beautiful Ticia!!! 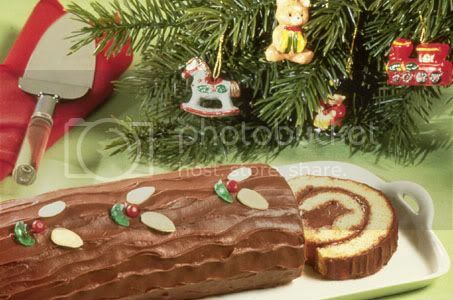 Every Xmas Pawty Needs a Chocolate Yule Log!!!! GROMIT! They're beautiful! I'm here by the food!!! MOL Shrimpies!!!!! ANGEL AND MERLIN!!! Wow, it's been WAY too long!!! How are things down under? What do you do for Christmas when it's the middle of summer? MY ROSES! Darling they are GORGEOUS! Thank you!!!! Sweetheart, do you have any snow yet? It was a pretty day here today - warm, too! 50s!!! Hi Ticia!!! Hi Angel and Merlin! We have another new Auntie from Australia that we never met. Mommy traveled with her in France last summer and she LOVES kitties! Her name is Paula, but I don't think her kitties are on Catster. We had a few flakes in the air today, but not enough to show up on the ground. It was warm here for a few days which made mommy's allergies bad, but it's getting frosty again!!! We LOVE snow!!! Mommy really super loves it. We get to be all cozy inside and watch it and it's so pretty! Almost as pretty as Livia. Silly that you sing those songs! Someone should write some summer Christmas songs! Gromit, can you see the links Morticia is posting? 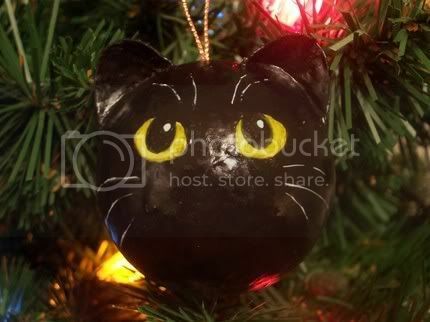 Heeee, mommy says that ornament looks like Hudson!!! We have the pretty black cat that your mommy sent us a couple years ago, Ticia! 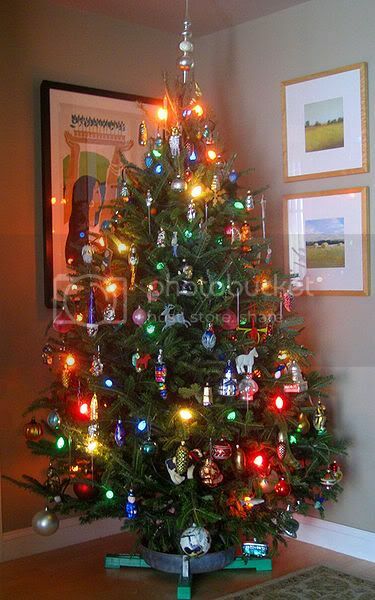 It's in one of the best spots on the tree!!! Yep, we see 'em fine! Isis, is that the one that is the black lacquer (sp?) cat? We're so glad you like it!